Composer, pianist and music essayist, Stevan Kovacs Tickmayer was born in 1963 ( Novi Sad , Vojvodina / ex-Yugoslavia) as a member of Hungarian national minority. Since 1991, he lives in France .In 1986 formed his ensemble Tickmayer Formatio in which classical trained musicians was employed as well as new jazz or improvised rock performers. Very soon, the group got an international profile: in different combinations over than thirty musicians collaborated with the group.For four years, Tickmayer was a member of the editorial of New Symposium, a magazine for social questions, art & culture in Novi Sad. In this period, he organized two international festivals for contemporary music & arts.In 1988, he gave lectures in summer course for improvised & composed music in Szombathely (Hungary) and one year later formed a piano duo with the father figure of Hungarian contemporary improvised music György Szabados. In the period of 1990-1997 he composed music and performed it with his Formatio for the Orleans based dance group Jel led by the choreographer Josef Nadj. Since 1994, collaborates frequently with Chris Cutler and co-founded The Science Group. In 1997 participated in the world premiere of Kurtàg's Six Pieces For Trombone & Piano, in Amsterdam . In the summer of 1999 was invited as a resident artist by ART/OMI, New York . 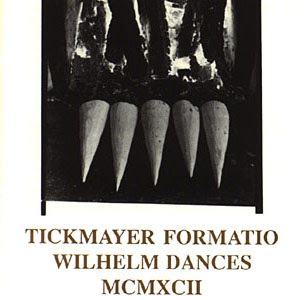 In 2003 Tickmayer was invited by Gidon Kremer as a composer in residence on the Lockenhaus Chamber Music Festival. During this residence several of his pieces were performed and world premiered. Many thanks! I was one, or the one, who requested Tickmayers' works. Would also rejoice if the Kagel Exocita & Tactil could be listed. They were out on several sites but all download links has been deleted as of now. I am sure I express this wish on behalf of many! Thank you for this, but it's a pity that link is dead! if you could reupload this album, it will be great!